I love it, it’s so easy to use. Very convenient! I love how there is a lot more! Live view never works. Very user friendly app for consumer and or business owner. Would recommend. What an amazing product! I am no longer homebound and can easily get into our car with assistance from my husband. He used to have to physically pick me up to get me in the car which is a terrible strain on his back. We love the Slide ‘n Ride and now look forward to getting out of the house! Thank you so very much Slide ‘n Ride!!! They just keep improving the app and I love it I run my shop through the app more than the website especially the fact that I can see the out of stock items and recently edited products. I like the app better then the website admin ! The app is so convenient and well thought out! I have submitted to bugs and nothing has been fixed. When typing in a name of a product when searching for a product there is a lag that causes a missed letter in the spelling of that item. So when typing "water bottle" you get "wter bottle" or "waer bottle" also, when trying to put a photo on a created item it will not work. It acts like it is going to per usual but then disappears. The jerk that wrote the nasty review before me is very frustrated with sales and is taking it out own the purple themed app. I quite enjoy the app and love the cash register sound when I make a sale. I would ask for something in the next update, which I just learned will only be a week away according to the idiot who left that very unhelpful review. I’d like to see my sales with a custom timeframe. Or just add year or lifetime. The week and month statistic are good but would like to see total sales for this year and previous years. Can almost do anything from the convenience of your phone. I actually love Shopify and am happy I chose them to host my site. There are a lot of features that make owning and operating an online store effortless and effective. But the last few app updates changed something with the orders. So I’m going to focus this review solely on that feedback. (I’ve updated the app versions a few times and the problems continue, it’s time to point out what someone in testing is not finding.) Home screen: the “Orders to Fulfill” show a number of outstanding orders, but when I click on it, it shows nothing except an article on how to get my first order. As I try to find my orders that need to be fulfilled, I move to the “Orders” tab and click there. This screen also no longer shows orders that aren’t archived/fulfilled. I have to click on “All Orders,” scroll through the list and find each one, and hope I don’t miss one NOT efficient and just a matter of time before some get missed. Still in the “Orders” tab, when I click on “Draft orders” - which is used for all my quotes, anything I have emailed to a prospective customer no longer shows in the quick preview. I have to go to “All Draft Orders” to see who I need to follow up with. After I’ve sent a draft invoice (which would be better worded as a quote- since it doesn’t keep the same invoice number when they pay), if I need to revise the quote and resend or send again, I have to resort to a saved copy of the prospective customer’s email address OUTSIDE of the Shopify platform because even though it saved most of the contact information, it deletes the email address. At the beginning, I didn’t know they would not be saved with the draft invoice; this is a frustrating way to lose potential sales. If the customer has ordered before, even if they agreed to receive marketing, their email does not stay in a quote/draft invoice contact information. My quotes are created when contacts request pricing on custom orders or more regularly, if I see the person at a sports game, school event, etc and they want to personally tell me what they want to order. Here’s an example: I create a draft while I talk to them and email it to them so they can easily “complete their order,” pay, and receive their items with very little work on their part. Then when they tell me (days later) that they lost the quote in their email and need a new copy or want to change the contents of their order, I don’t have the email address still connected. People complaining about seo and sales conversions are hilarious. Do your own marketing, that’s not Shopify’s job. They are running a platform for you to collect money. Period. It’s incredibly user friendly. Great info at a snapshot, and the only way to make changes is to, oh I dunno, issue updates? Keep being great shopify. I had an incredible year thanks to this platform and am excited to see what next year brings. Great job on the quick turnaround on getting an update pushed out before Christmas. One of the most important things about Shopify that everyone needs to understand is they have a support team that is second to none. I am a 5 year customer of shopify and I remember when we did not have the flexibility we have today. Thank You for building a platform that rocks and thanks for an app that continues to evolve and become better. Ya there are minor things we can add for functionality that anyone would prefer or would change. But the Shopify team knows how to make things that make sense and work great ! Shopify you are the best! Love the advice it gives, the way it shows you want could help you while building your page. Shopify app is by far the greatest. I’m so glad I can easily get to my orders from an app. I can access most of the same features as my computer. I was using Bigcommerce they I started using Shopify and man what a big difference now I’m a Shopify user for life. Love this app. Looking forward to lots of sales in the near future! Great app, where’s Cancel Order? Great app—really well thought out. I may have missed this in the thread, but where in heavens is the Cancel Order option? A little surprised this has not made its way to the mobile platform. Ever since the new iOS update I can’t even open the app. It’s on a continuous “upgrading” loop. Please fix ASAP! Information helpful. Tips are great. App is easy to use. This is a GREAT option! We need the ability to make changes to the site.. find products low in quantity, etc .. all the capabilities on the desktop site would be great on this app.. Very great app for sellers. I have used all of them and this is the most user friendly. Great e-commerce tool, but it need some updated to make it work 100% As of right now the dashboard is not working. This App is amazing !! Get started today making your e-commerce store. I hesitated and now I’m finally doing it and I’m seeing amazing results. Shopify is the best way to go. It’s a great way to start for a beginner. I find that using Shopify makes it easier to manage multiple parts of your business compacted within one app, however I do feel that there are some areas that need to be a bit more accessible for example; online store management: creating and editing webpage content within your store— the options are very general and limited. To my knowledge —I’ve searched everywhere I possibly could— but you aren’t able to create form fields (for the customers to interact/input information into) and the mobile page content editing section is glitchy. Overall, everything else is very generous with business setup. I would recommend it to my peers and/or anyone else. The app is kinda slow and needs refreshing (sliding down) every now and then while using it to show up to date data, otherwise I JUST LOOOOOOOVE IT!!!!! I really like the ease of using the Shopify app every aspect is right on my phone including the integrated features thanks. I couldn’t be happier. The app, the support team, the results. Highly recommend Shopify. Supreme-q used this site to take money from consumers using Shopify’s e-commerce tools. Shopify leaves it to the consumer to get their money back and takes NO responsibility for it. The app does just about everything the desk top app does so you can keep up with your business anywhere you are. Great app! Really enjoy the luxury of quickly accessing everything I need to for my business. Shopify has helped me totally transform my business, so much so that we’re moving to a completely online format in the next month. I’m extremely grateful that they have built this platform for business owners to expand and grow. It’s very simple to manage things. The app is so responsive and you can do anything you need with it! Been using for over a year and it is so easy! So easy to get a snapshot and I do most of my editors on the app- it’s so simple . Love love love it! absolutely terrible, helpless front line support in the form of gurus who can’t even connect you with a supervisor as they can only communicate officially using chat. the app is extremely buggy as well. This app is the way to go if your looking to start your own business. Put a plan into motion, do your research, and take full advantage of its 14 day free trial, the customer support is the best I have ever had in my life. Honestly this app gives you all the tools you need to be successful, the rest is up to you. Amazing app minus a few glitches, but you can do everything on it, including customizing your store. Very impressed!! Don’t know what I’d do without Shopify! Great widgets and easy to use and manager my business in the go! Essential to running our online and in store business! There’s nothing that compares with the Shopify app! I travel a ton, shopping for both the online and brick and mortar stores, and am always able to update the website’s inventory in real time as customers makes purchases. This feature alone is pretty priceless. I can update almost any aspect of the website in a few minutes, so cover pages, product categories, etc. are no problem. The only thing I’ve not been able to update (on the go) is the announcement bar. The integration and accessibility of other apps via the Shopify platform is also possible from my phone, so if I need to edit SEO, pull analytics, see sales and fulfill them, I’m able to do it with the touch of a couple of buttons. There’s honestly so much to love about this app, but there isn’t time to write more. I’m summing it up in a word or two for people on the fence, it’s Absolutely Brilliant! 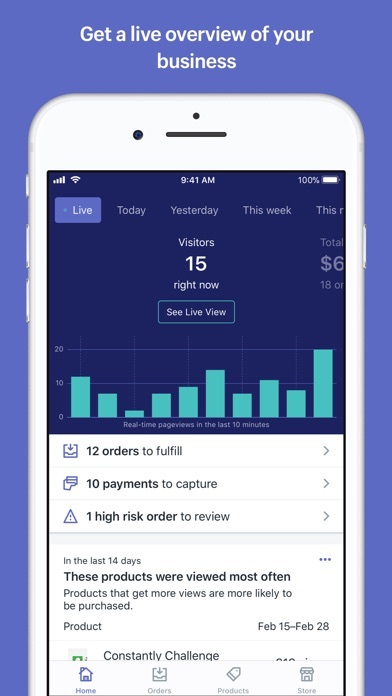 Love Shopify — adore the incredible App! Has been so helpful to us as we start our new business! The Shopify app and store I have has allowed me to get my art and creations out there! I never could have done what I have done without the simplicity of Shopify and affiliations! I hope to grow my store in the coming year! This year my store sustained itself and I have learned a lot! I’m only rating this too say that Shopify changed my life. I absolutely love this platform and recommend it everyone. Its very user friendly. They have free events to help you exceed. It's 24hr customer service. The reps actually are highly trained to assist you in just about everything. They're always sending out information to help you with your online store. I can go on and on. This is the best “work from anywhere “ app I’ve ever used. Easy to use & functional. Shopify has excellent customer Service. The do not mind going above and beyond to make sure that you are able to understand the process. My business runs so smoothly I highly recommend. Love this app for point of sale updates and business on the go!! One of the best business apps out here ! Wish the pay outs were faster . 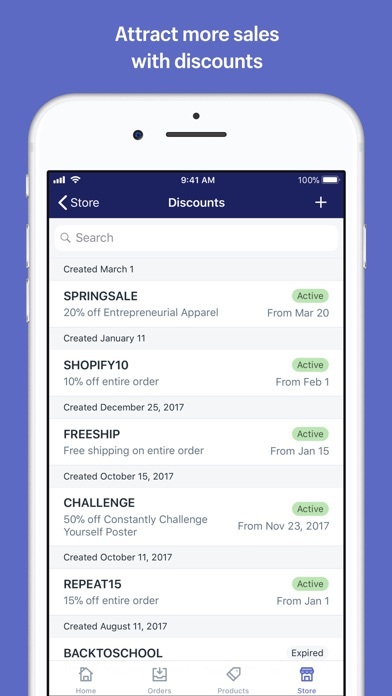 Shopify App Makes Owning A Business Easier! Love the Shopify app. I can update product information, delete products, make changes to different aspects of the site and manage orders. What can’t I do? And if you travel, it’s essential for running your store. Use it every day. Clean interface and a lifesaver on the road, when quick updates are needed. Love Shopify, especially the app! My whole website basically can be run from my phone using the Shopify App! Can run your whole business on it on the go! I love the Shopify app! It helps me with my business day to day! Been using this app for 8 months. Just a bit slow but everything work well. Great platform for beginning entrepreneurs! Would recommend to any online start up and e-commerce stores. The best platform I’ve ever used. Thanks so much. This app is so good I prefer using it in lieu of the dashboard on my laptop/work station. For me sometimes when I’m trying to cut trough the chatter working on the app for quick updates to my site is the best. I live for being able to get exactly where I need to be, and make my changes. Plus the snap shots are invaluable. Love it all. Now only if I could send a great email from here I’d be all set. It drives me crazy when I can’t use many of the desktop features on my phone. 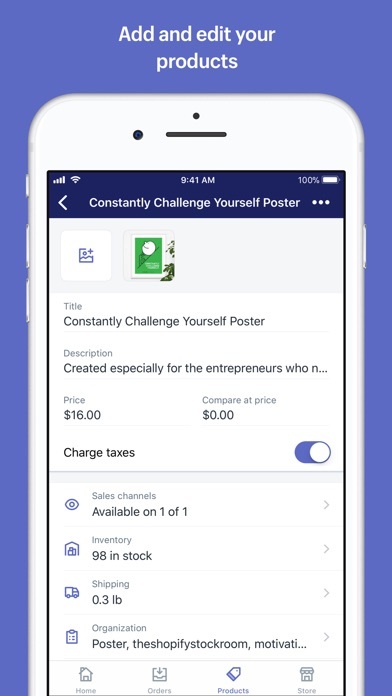 Shopify has thought through that and has put almost every feature you could need to operate your shop on your phone. I have used shopify for 3 years. I can’t imagine operating a business without it! 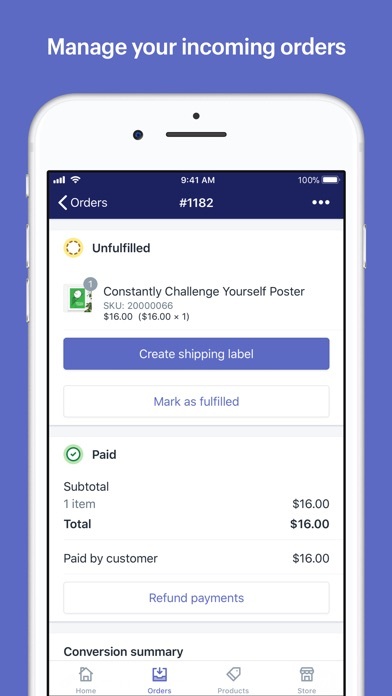 This app has everything you need to run your online store from your phone. Love hearing the “Cha-Ching” from each sale. Love it! This ap does everything I need! Satisfied!! So far so good!! I feel great about having my own online store!! I love that Shopify really tries to help you succeed. Their website is very informative and helpful. It explains everything step by step....it’s been 2 months so far and I have only had 4 sales but clearly I have to work on my advertising and marketing lol Good Luck!! The value of the iphone app to me is notification of sales and glances of activity on Apple Watch. Watch companion app Just shows LOADING on every screen. This is really sad. Big company with a big user base needs to fix it to death what it says it will do. Everything you need is right there for ya. Very handy! Absolutely love the mobility of this app, can run my business swiftly while out and about! Keep it up guys. It’s pretty easy to use and very clean. The app is amazing. The more features they add, the less I have to be on a pc to check my store. Please keep up with the updates! And if you need any testers hit me up! Selling Gourmet Catnip like hot cakes! At Skinny Pete’s Gourmet Catnip, the new Shopify app is the engine for our on-line sales. There are a ton of useful features and great integration with sales channels like Buzzfeed & Facebook. Awesome app to keep business moving! The Shopify app has been fantastic to work with and makes it so easy to stay in-the-know of how my shop is doing during the day. Their recent updates are great and I’m 100% happy with how the app functions! App works great.. you can monitor and accomplish a lot through this app, which makes your life a lot easier! Last update removed the ability to send an account invite from the customer info page, how do I do this now??? Simple and gives your business immediate life! So Glad To Have This App!!! 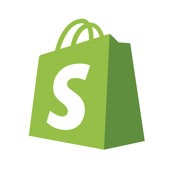 The Shopify app is really easy to use & helps me a great deal. I love the fact of being able to run my site successfully – right from the palm of my hand. I can do a lot of quick tasks with this app and the stats at a glance are helpful. It doesn’t replace the website by a long stretch but i wouldn’t expect it to! It does just about everything I need when I’m away from my computer. Really wish I was able to add items to different collections when creating products from the app instead of having to log on online to assign a collection. Helps you run your store on the go. What else do you need? Easy automations and we just started to use shipping awesome!!! I love that the latest update allows you to do almost everything you can do from the site. Much appreciated to not have to toggle back to the desktop version. Great for keep up and making light changes! I wish the LIVE view would pin point the country or state that the people are visiting online. Maybe they will fix as time goes on. Shopify shut down two separate stores’ checkout with no warning. Once shut down, they will not reactivate. They took the money I had invested in the stores with no refunds. The reason for the shut down? I accidentally loaded a face wipe to my store. Even removing it does not make it possible to reactive my store’s checkout. I lost hundreds of dollars twice. ...there are a few things that I have issue with but Shopify has been very responsive to help fix it. I’d recommend Shopify over any other e-commerce platform. They are regularly adding new features that are beneficial. Use for my business everyday no problems! This app is very well designed and easy to use. I can run my Feeding Tube Holder business while on the go and never miss a fulfillment. It’s even integrated with Amazon Alexa!!! I use the app 24/7 to run my business it is robust and meets all my needs. Haven't had any problems with it in the two years that I've had it. The App is frustrating for so many reasons. You select various tabs and the screen never changes. Its like a puzzle you’re challenged to figure out. Shouldn’t be this difficult to use, especially when paying for it. If you have a small business Shopify is an amazing way to get noticed. It’s super easy to setup and reasonably priced. Order printer does not work, invoices and packing lists are formatted totally incorrectly and can not be printed using Apple AirPrint. Having the app is great until you realize that you still need a desktop for almost everything you do. Helps me stay on top of my business. Great way to keep tabs on the business while I’m out. I also use it on my iPad and it’s equally as nice. Though you cannot make product variations on the app. But that’s no big deal. So, if your business is always on the go, and consistently updating inventory, prices, or just a simple daily sale. The app I suggest to any business owner. You can view mostly everyone from this app to a log online. I’m on this app between 40 times a day. One thing I suggest for this app, is you can view abandoned checkouts. Otherwise, you can track customers packages, email customers, add discounts. Disable discounts, and importantly log in to view all your reports! Shopify is an easy drag and drop for websites, and makes selling anything online a breeze. Checkouts, products, pages, blogs, contacts, themes... everything I’ve needed for a few businesses already. I’m loving the Shopify app so far. Lots of apps to work in the backend of my store and I’m super excited for my store to continue growing on Shopify. I’ve been using Shopify for now a year or so, and it’s been amazing. And if you are wondering like I was... yes Shopify does connect to Clickfunnels. 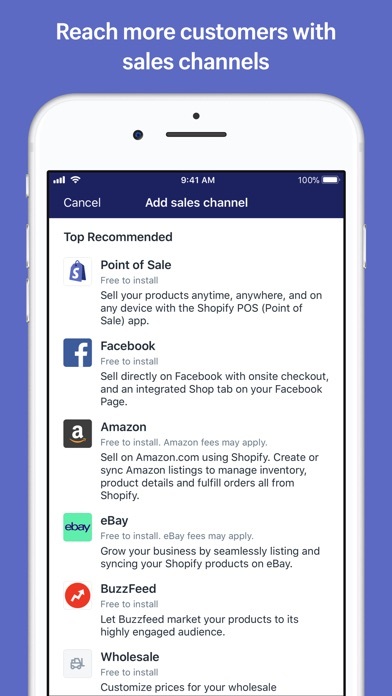 And yes Shopify can keep track of all your Etsy, Amazon, and Facebook marketplace sales. Shopify is only $29 per month after a 2 week trial. Love Shopify! So simple and a quick way to sell my products and ship them at a discounted rate. Like my children, I couldn’t give Shopify enough praise. From user functionality to their customer service and FAQ section. They really have nailed it. There are a few functionality things I would recommend upgrading into their standard offering but I’m that will change with time. Amazing software. App deletes product info, please help! The app is cool and convenient, but every time I update my product information it gets deleted, even if there were previous information entered on desktop. The latest update still won’t load anything...can’t even get to the point where I can log-in. Totally useless. It takes over an hour for a product’s photos to upload, and sometimes when I go back and check, the photos just disappeared completely. This is really affecting my ability to manage and upload inventory in a timely fashion. Very frustrating. I’m new to this app. It was a little overwhelming at first. Once I got the hang of it, most of it seemed rather easy. I am still a little confused about a couple of things, but I’ll learn those things too, I’m sure. So easy to use and navigate! It’s amazing that you can call Shopify and actually speak to a person and get a person without waiting on hold. And they were incredibly friendly and knowledgeable! The app won’t access any of your normal Shopify control panel settings, such as queries you rely on for orders, etc, but it’s not bad. Love this app for my online store. I am able to do everything from my phone that I can do from my laptop. Thank you so much! Makes managing my store super easy! Love the app. So easy to have my entire business at the palm of my hand. An all around great platform to launch your store. It takes some time to get the hang of it but once you do it’s smooth sailing. Lots of analytics provided and tips that help you fine tune your site. Was a great move off Etsy. Shopify is just awesome !!! Excellent & User friendly interface with world class customer service team. Long live Shopify!!!! Shopify continues to produce a great product. The app is intuitive and has some great features. I love that I have critical metrics at my finger tips while I’m on the go. This app is easy to use & works perfectly with my specialty retail website (Gifted Astrology dot com). I never thought doing business from my phone would be easy or reliable until this app - now I can stay in touch with my customers 24/7. Shopify makes things so much nicer than the other ecommerce sites I’ve used. App works great, better than the desktop for something. Love it.